A very messy red Austin Seven. It is different, though, to the other one I have . This one has free spinning wheels, not that frequently encountered for the Austin version, and it is a different casting. Underneath there are clear differences, including how the text is set out. This one also has the strangest thing - a spare steering wheel loose inside! It looks like it’s an original and as there is no evidence that the model has ever been taken apart I can only assume that it has been there since it was made. Most odd. 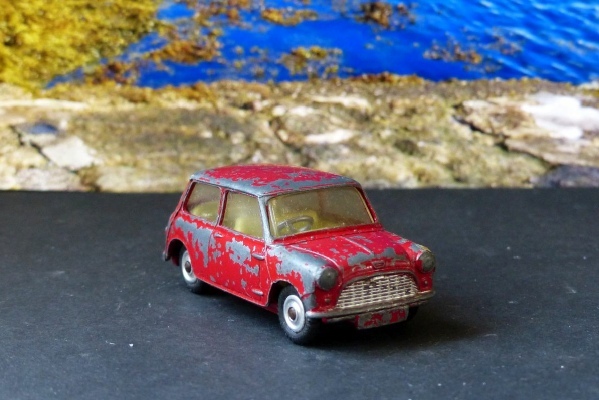 It is in pretty poor condition as regards paintwork and the rear window appears to have been close to heat at some time, being slightly deformed. I thought that might have been how the second steering wheel had got in but I think the perspex is just cracked so that isn’t so. A good pale yellow example!